FutureChem® SSIPA is a sulfonated diacid that is used primarily as a polymer modifier. 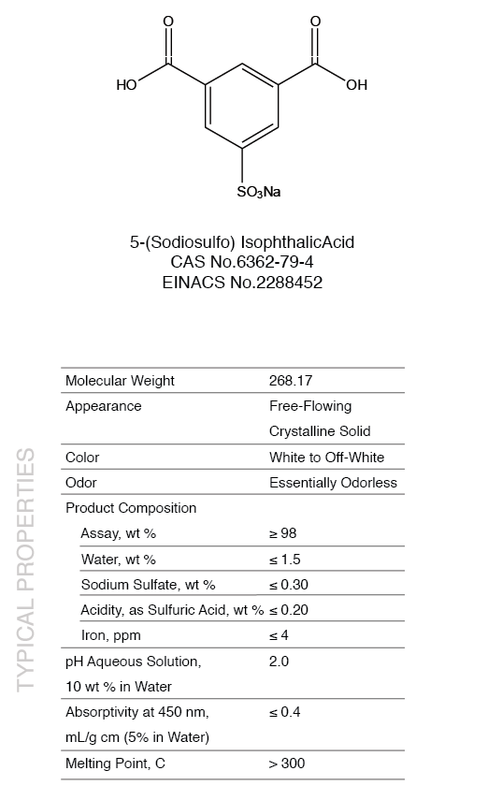 Sulfonated monomers such as FutureChem® SSIPA are used to impart cationic dyeability in textile and carpet fiber applications. Nylon contains polyamide groups along with some level of terminal amine groups that render the material inherently dyeable with acid dyes; however, the use of basic or cationic dyes is not favored. The addition of a sulfonic acid containing group such as FutureChem® SSIPA into the backbone of the polyester imparts substantial cationic dyeability to the polyamide even at low levels (typically 0.5 to 2 % by weight) by providing sites for the cationic dye to react. Due to the diacid structure of FutureChem® SSIPA, it can be used with virtually all polyamide types including nylon 6 (caprolactam type monomer) or nylon 6 (HMDA / adipic acid type monomers) since it reacts into the polymer backbone to form a linear polymer. Cationic dyeable polyesters (copolyesters) can also be prepared by the reaction of FutureChem® SSIPA into the polyester backbone via esterification with the glycol being used (EG, DEG, PEG, etc). FutureChem® SSIPA added to polyesters provides the necessary ionic sites needed to complex with cationic dyes to allow for durable cationic dyeability, whereas non-SSIPA modified polyesters must be dyed by other methods (small dye dispersion, etc). Cationic dyeable copolymers can also be made by the reaction of low molecular weight FutureChem® SSIPA-modified polyamides, derived from caprolactam, into a polyester polymer backbone. FutureChem® SSIPA has been used in magnetic tapes to improve adhesion of polyester layers and in printing inks to improve printability on PET bottles. FutureChem® SSIPA is used in waterborne polyester resins for coatings. Nonalkaline water-dispersible systems are produced that offer enhanced stability and low VOC (volatile organic content). Aqueous dispersions can be created without added surfactant by using smallamounts (<10% by weight) of these ionic intermediates to impart hydrophilicity to polyester resins. FutureChem® SSIPA is used as a shape-memory polymer for fibers used in the textile industry. FutureChem® SSIPA is available in 100 kg net weight lined fiber drums and in (1 kg) sample quantities. Bulk bags in weights of 250, 600, 1000 kg of 5-SSIPA can be provided. Because FutureChem® SSIPA is a hygroscopic material, it should be stored in a dry environment (covered and enclosed to minimize hydration). 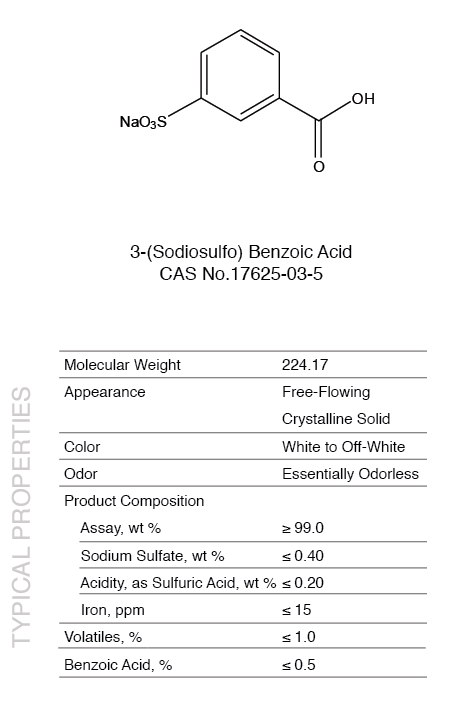 FutureChem® SSIPA is stable under normal warehouse conditions. FutureFuel Chemical Company suggests that a material supplied in fiber drums be used within 48 days. Under United States Federal Food Additive Regulations 21 CFR 175.105, FutureChem® SSIPA may lawfully be used as a monomer to make polyester resins used as a component of food packaging adhesives. FutureChem® LiSIPA is a sulfonated diacid that is used primarily as a polymer modier. and carpet ber applications. Nylon contains polyamide groups along with some level of terminal amine groups that render the material inherently dyeable with acid dyes; however, the use of basic or cationic dyes is not favored. The addition of a sulfonic acid containing group such as FutureChem® LiSIPA into the backbone of the polyester imparts substantial cationic dyeability to the polyamide even at low levels (typically 0.5 to 2 % by weight) by providing sites for the cationic dye to react. Due to the diacid structure of FutureChem® LiSIPA, it can be used with virtually all polyamide types including nylon 6 (caprolactam type monomer) or nylon 66 (HMDA / adipic acid type monomers) since it reacts into the polymer backbone to form a linear polymer. the necessary ionic sites needed to complex with cationic dyes to allow for durable cationic dyeability, whereas non-LiSIPA modi ed polyesters must be dyed by other methods (small dye dispersion, etc). Cationic dyeable copolymers can also be made by the reaction of low molecular weight FutureChem® LiSIPA-modi ed polyamides, derived from caprolactam, into a polyester polymer backbone. In addition to improving the cationic dyeability of the polyamide, FutureChem® LiSIPA also provides substantial stain resistance against acid-type dyes typically found in foods and beverages. This feature of FutureChem® LiSIPA in polyamides is particularly important in the carpet and textile industries. FutureChem® LiSIPA acts to protect the polyamide against the uptake of acid dye by reducing the number of terminal amine groups that would ordinarily react with the acid dye in non-LiSIPA treated polyamide. Since the FutureChem® LiSIPA is reacted into the polyamide, the stain resistance is long lasting as compared to post-treatment of the polymer with a topical stain resistant material that is prone to being washed off with time. FutureChem® LiSIPA is available in 100 kg net weight lined fiber drums and in 2.2 lb (1 kg) sample quantities. Bulk bag weights of 350 kg of FutureChem® LiSIPA can be provided. Because FutureChem® LiSIPA is a hygroscopic material, it should be stored in a dry environment (covered and enclosed to minimize hydration). FutureChem® LiSIPA is stable under normal warehouse conditions. 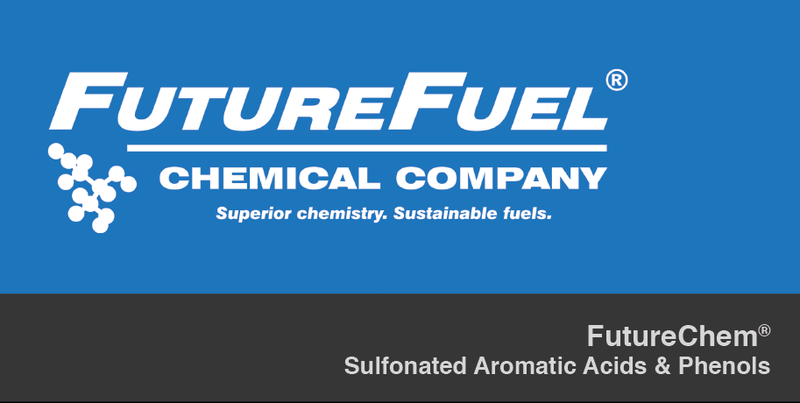 FutureFuel Chemical Company suggests that material supplied in fiber drums be used within 48 days. 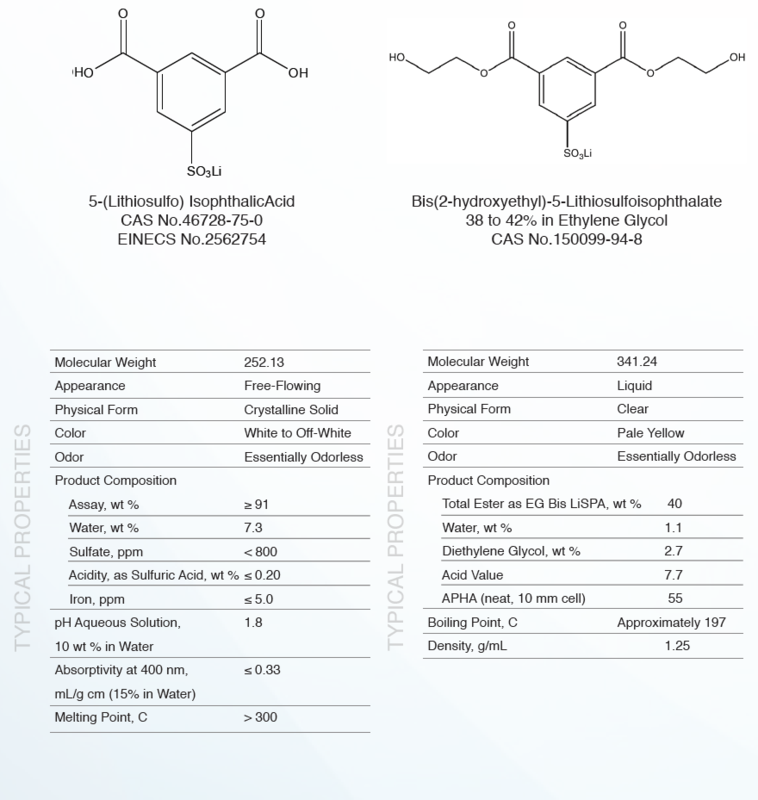 FutureSol® EG LiSIP is available in 2700 lb net weight totes and in 2.2 lb (1 kg) sample quantities. FutureSol® EG LiSIP is stable under normal warehouse conditions. Additional package sizes may be available upon request. FutureChem® SBA is a sulfonated monoacid that can be used in waterborne polyester resins for coatings or as additives in cationic or basic dyeable fibers for either polyester or nylon. The monoacid moiety functions to control polymer chain length while still imparting similar properties to the chain extenders FutureChem® SSIPA and FutureChem® LiSIPA. 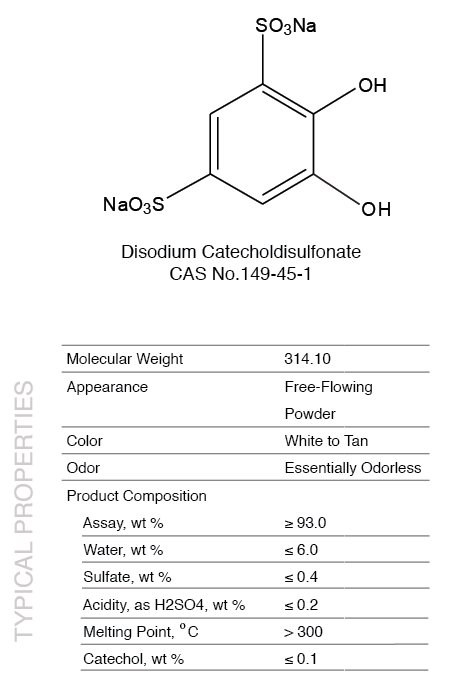 FutureChem® CDS is a disulfonated derivative of catechol. FutureChem® CDS is most widely known as a strong chelator of iron cations. Aqueous solutions of FutureChem® CDS in the presence of iron exhibit blue to red color. The color of the solution is pH-dependent. The most prevalent use of FutureChem® CDS has been in photographic applications. Potential applications include smart coatings for corrosion detection, laundry and dishwashing detergent, inkjet printing, and hydrophilic adjuvants.